Things never matter unless they are close to one’s heart. It is not about how much expensive a thing really is. It is about the emotions and sentiments attached to it that matters. I remember I had all those gifts and toys with me that ever was given to me by my loved ones, although they were insanely crazy but yet I always kept them out of love, I never wanted to lose them. Sometimes memories attached to the thing matter more than a thing itself. Sometimes we are given a special thing by a special friend and it just adds to the value of the thing because that person matters to us. People buy expensive and most costly gifts to give to their loved ones. And why not? It is their right to feel cherished this way. However one should always cut the coat according to the cloth, and buy what one can afford. The same goes with one’s personal belongings, we get the luxurious car for ourselves, we make the lifestyle lavish and sophisticated, we buy all the fancy clothes and designer wear just to stand tall and not feel any less than a celebrity. We buy the most popular smartphone just for our own pleasure, but we should make sure to have a saved money intact for the rainy days. Always have the best for yourself that you can afford no matter if it is an expensive iPhone. 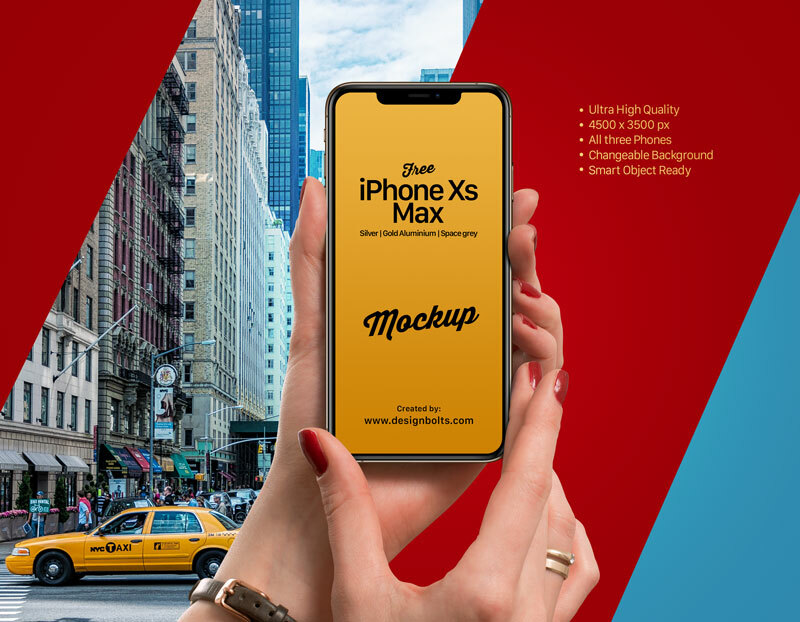 Coming towards my today’s post which is showcasing a free iPhone Xs Max in female hand mockup. This mockup can be used in both commercial and personal projects. You can display an image, wallpaper, application design, typography or anything at this sort to your client as a presentation. And he would definitely get the idea that how his respective requirement will appear in the tangible form. iPhone Xs Max is said to be the most expensive iPhone that we have in the market now, and yes, it really worth the price because of its spectacular finishing, bigger display, ‘oh so amazing’ battery life, color, excellence and camera. I personally cannot pen down what this magical smartphone really is. Surely we cannot wait to buy the new iPhones. So what are you buying this very year? Let me know, I will be bringing more freebies for you all, so stay tuned guys. You are never going to get disappointed by the blog. This is a sure thing.